We have got used that there is one or several dictionaries in ereaders, to which we can turn for help while we're reading. It would be great, if your ereader could help you in learning foreign languages. 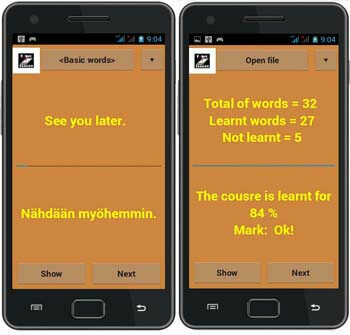 In 2009 Ivan Naidenov made a programme for ereaders of Pocketbook, which can ease learning words, as when you're learning a foreign language a big vocabulary is may be more important than knowledge of grammar rules. Lower we'll tell about this programme in details. This programme is only for users of Pocketbook. It enables to open special MCL files - cards, containing words and their translation. You also can put in images in the third field of the card. After installing the programme in your ereader you can just choose the right file with cards on "the bookshelf" of your device, then the programme will start itself in test mode. In this mode the words are shown in the up field of the card (see the picture), if you know their translation, go to the next word, if you don't know it, you open the lower field of the card with translation. In this case, the programme fixes that the user doesn't know this word. By the end of the test, the result is shown on the screen. So, if the user will be learning words for about 20 minutes, then after about two weeks he'll remember most of the words. The programme Memorum has an opportunity to show some files of the cards for timetable or for calendar. In archive with the programme there is detailed documentation about using and installing of it, and also a utility, working with Windows for making new and changing old cards. You'll find many cards for the programme at the end of the article. The biggest disadvantage of the programme Memorum is that it can work only on Pocketbook ereaders. We've tried to correct this disadvantage. So the idea of the programme Word Trainer appeared. The programme Word Trainer is an eased variant of Memorum. There's no opportunity of using calendar for opening cards for timetable and there's no support of cards with three fields (with images). The programme is done for two operating systems - Android for working with ereaders, tabs and smartphones and Windows for working with computers. It enables to open the same MCL-cards on these devices. The interface of the programme is very easy. First, you should open file of the cards, using the guide (in Android variant at the upper window the folder with cards, and in the lower - the file). The button Next is for scrolling of them. If the word is not familiar, you should push the button Show , then the translation of this word will appear. The button ▲ is for choosing the order of showing the words (mother tongue/foreign) default is shown the second field of the card (foreign word, the user should tell it's translation for his mother tongue)., after pressing button ▼ the first field of the card is shown (foreign word, the user should remember it's translation to his mother tongue). If you, using a file manager, will make on your device a folder "word_trainer" (the full way - - "/sdcard/word_trainer") and unpack there an archive with cards, so when the programme starts it will show it's contents. If there's no folder with such name the programme shows the contents of the main catalogue of the device. Lower you can download some cards, but it's possible to make them yourself. There are two programmes for it: utility for making cards, produced by the author of the programme Memorum, will enable to make ards one by one by writing text in the fields you need, and utility for making groups of cards converts a text file with words and their translations entirely in MCL-file. The base of cards is always supplemented as by us, as by other users of ereaders. 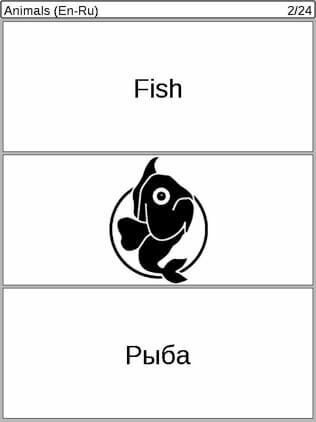 If you want to add your own MCL-cards, please, send them for e-mail adress e-ink-reader@yandex.ru . For normal work of the programme make a folder "word_trainer" рon your device and unpack there an archive with cards. Series of the cards "... for 30 minutes" is made for tourists or people going for buissness trip abroad. Cards from this series are divided for topics: "Greetings", "Main phrases", "Airport", "At the hotel" and so on. You would spend about 30 minutes for learning two-three topics. So, if you study every day about 30 minutes, after 2-3 weeks you will be able to ask about the way, change the room at the hotel, make an order in a restaurant or invite a girl to dance.